Project: The Fauconberg Wing. The Cheltenham Ladies' College. 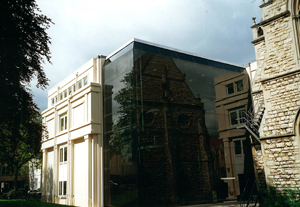 Above: photograph of the college extension. A new project commissioned by College to replace a previous building on their busy campus. The new Wing accommodates a range of arts and technology facilities including classrooms, technology labs and study facilities over five floors. These have been accommodated behind a retained facade to two sides. 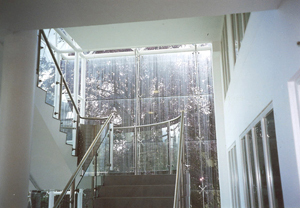 Access to all levels is by a feature staircase accommodated within a fully glazed atrium overlooking College grounds. To maximise the utilisation of the Site the architects, Oxford Architects Partnership, added a floor below ground level in the form of a basement, with natural light from a light-well around two sides of the building. Even before the project was completed there were problems of water penetration occurring, with water entering the basement at the point where the new and existing buildings met. It appears the tanking to the Basement had been installed in an unsupported condition. As a result joints in the tanking, when subjected to the hydrostatic pressure of rising groundwater, failed and water entered the Basement. At one point a sketch was handed to the Contractor by the architect, showing a suggested remedial approach. This proposed the injection of grout into the cavity to press together the layers of the tanking. No Architect’s Instruction was issued subsequently. Much was to turn upon that sketch. Notwithstanding the potential problems, the building was handed over to College and Practical Completion was Certified, together with a substantial list of outstanding matters. Problems continued, with incidents of water penetration into the basement. After a protracted period in which College attempted to persuade the architects and the Contractor to identify and remedy the cause of the problem, the matter remained unresolved and the problem of water penetration continued. At that point we were asked to work with Solicitors, and to provide Opinion upon the defects, and upon the responsibilities and liabilities of the parties. During our initial inspection we also noted fire-doors, which divided the main teaching areas at each floor level from the atrium, were ineffective. The doors did not comply with any of the available guidance on the performance of such units. Their design (they were oversized) made it impossible for them ever to provide an effective separation. Furthermore, the architect had failed to ensure the independent third party Certification required by the Contract Documents had been supplied. There was also the matter of pattern staining to the atrium glazing, which can be seen in the illustrations, and the absence of a controlled method of surcharge for rainwater from the flat roof of the atrium. 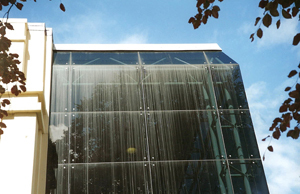 In the absence of the latter, during periods of heavy rainfall, when the rainwater drainage system was unable to cope, water surcharged down into the atrium through the smoke vent in the atrium roof. Additional problems included repeated failure of the pumps serving the pumped drainage system resulting in inundation of the teaching areas within the Basement by sewage laden water. A Claim by College against the Architects was deemed to have been made out of time, and a subsequent Appeal by College failed. In consequence College lost their opportunity to recover against the Architect's Insurers. In a subsequent Arbitration between College and the Contractor the Architect's sketch was deemed to have constituted a valid Architect's Instruction. The Contractor was awarded the consequent costs of complying with the Instruction despite the works represented by the sketch constituting the remedying of defective work originally executed by the Contractor. For the Appeal decision, see: http://www.bailii.org/cgi-bin/markup.cgi?doc=/ew/cases/EWHC/TCC/2006/3156.html&query=EWHC+and+3156&method=boolean. The moral of the story? For Employers, recognise at the outset that works involving excavation and construction below the water-table are exceptionally risky. Thus, ensure designs prepared by the design team are complete in every particular. If water does begin to appear inside the building, take independent advice and ensure a Claim is issued in good time. Never rely upon good will to resolve such problems. For architects, do not leave the design of critical elements such as Basement taking or fire doorsets, to Contractors. And, as soon as defective workmanship is suspected, open-up the Works to determine the exact cause of the problems. When issuing Architects’ Instructions ensure all drawings are fully co-ordinated, accurate and unambiguous. Specify and detail all tanking membranes with great care, and draw all details in three dimensions, not two. Remember, membranes have thickness and thus three dimensional features pose particular problems, and hence greater risk. “If you can't draw it, how can the Contractor build it?” is a useful mantra. Above: pattern staining to the atrium glazing.